Since Matt Cutts recently announced the death of guest blogging for SEO purposes, many Internet marketers have been exploring other options of obtaining links and building their client’s brand presence online. I believe many of us saw this day coming and were already putting to practice different strategies. One of those strategies we found to be effective is online public relations: a mixture of content marketing, reputation management, social media, SEO and public relations all nicely wrapped in a Matt Cutts-friendly fashion. 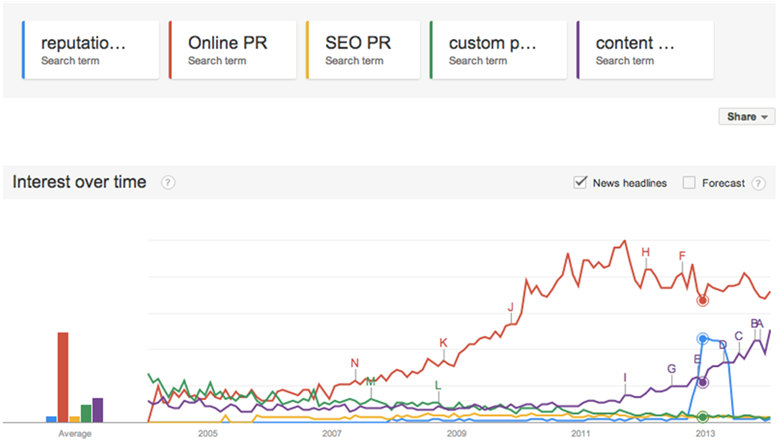 Online PR has gone by many names: SEO PR, custom publishing, reputation marketing. You can check out the graph below to see their popularity in the search engine. Online PR remains the top term because of its cost-effective approach to communicate with a company’s stakeholders. It takes the values and many of the same tactics of public relations and puts it to use in the digital world. 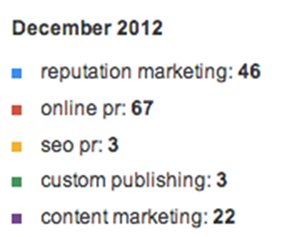 Online PR started gaining traction in 2010. According to the 2013 UK Search Engine Marketing Benchmark Report, 42% of companies surveyed are paying for online PR at their Internet marketing agency but an additional 33% said they plan to use the service in the near future. There’s no doubt online PR will continue to rise as a go-to service considering its ethical tactics, measurability, and results. The lines between content marketing, SEO, and online PR are becoming blurry. We’ve found certain tactics, like creating great content on your client’s blog, useful for all three to accomplish their objective. 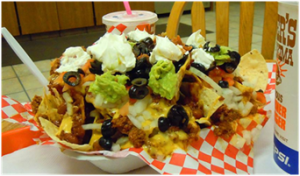 Since it’s closely associated with the other tactics, I’ve found it valuable to describe online PR to my clients with the metaphor of a taco salad. SEO is like a taco, content marketing like a salad, PR like chips and salsa; you combine it all together to get taco salad. Taco salad lacks some things a taco and salad separately have but it takes some of their main parts to make something better. It’s not a perfect metaphor, but it gets the point across about how online PR is different from other online marketing tactics and yet can be used to accomplish some of the same objectives. Link Builder: Build links by asking to guest post on sites, which may or may not be relevant to your company. This would bring traffic by people clicking on your inbound link as well as helping you rank higher in the search results. Content Marketer: Create awesome and usually interactive content for your website, share on social media, and watch the traffic come to you. Online PR: Find a newsworthy aspect of your company, create an online news release, and pitch the idea to a few online venues. The publicity you receive will give you traffic. Create buzz and engagement with the brand to create loyal consumers. The byproducts are inbound links and higher ranking in the search engines. Let’s take a look at an example of a successful online PR campaign with the startup Phonebloks. Back in September they ran an online PR campaign that attracted a lot of attention. Their YouTube video (shown below) describing their new product concept and mission has received over 18.8 million views in just a few months. The video asked viewers to create buzz for the product on a certain day if they wanted it to be produced. And with that they amassed a social media reach of 382 million and 900,000 supporters. They even got a call from Motorola asking to explore a partnership. To top it all off, they received over 2,000 referring domains, many of which came from high authority news sites that covered their story. Their campaign built them a strong and loyal online community as well. The campaign itself didn’t cost much money; basic video software, a well-told story and a hashtag centered on their event were all they needed. Everyone likes to customize their taco salad to meet their needs. Some just like it plain with the key ingredients of chips, salsa, beans, cheese and meat. Others like to spice it up with olives, guacamole and jalapenos.The same goes for online PR. Some businesses prefer the basic online PR optimization for their press releases and spreading their news to online newspapers. Others combine social media and content creation to that package. Your ingredients will change depending on your main objectives. Online PR professions need to be creative, social, persuasive and have the technical skills to adopt different tactics quickly and recognize new opportunities. The list below shows the major online PR tactics along with a link to help you better understand how to use it. First Step: Take an audit of all mentions of your brand and classify each as positive, negative or neutral. Do damage control if possible on negative mentions. First Step: If you don’t have social media yet, start building up a few social brand pages on sites that your target audience mostly likely will use. Complete and optimize your Google+ page. First Step: Create the perfect headline. Include a keyword mapping report that optimizes your press release for the page and topic it is linked to. Visualize your content when applicable with graphics, professional pictures and videos. First Step: Build a media list for online venues in the same niche as your company. Add the journalist you will be building a relationship with to a Twitter list to keep track of them. First Step: Create and optimize a company blog and begin writing content that would attract potential consumers. First Step: Reach out to customers and encourage them to write a review of your product on Amazon or of your company on Google+. First Step: Decide on the best form of communication with your publics online (send out a survey to learn what would be the best). First Step: Make sure all forms of customer service online (contact forms, live chats, social media) is being monitored and inquiries answered in a timely and professional manner. First Step: Find your company’s brand ambassadors via social media, Follerwonk, Pinterest or a Google search for influencers that you think would be willing to create buzz about your brand. There are dozens of tools on the web to help you with your online PR strategy but I’ve included only the major ones I have found to be most useful for everyday work. Use this free program to record outreach contacts and other data, such as tracking published articles. Multiple team members can work all at once on a Google Doc, unlike an Excel spreadsheet. Tip: Google Docs is a great place to share a media kit or the research for a content piece. This way you won’t crowd your email with attachments when you need to send the information to a journalist. You can just send the link to the shareable Google doc. Another free, must-have tool from Google. Check out this article about what to track in PR analytics to refine your PR campaign and track results. Tip: Online PR professionals should constantly be monitoring the trackbacks, assisted conversions and referrals in Google Analytics to better understand which tactics work best. If you’re doing a lot of emailing, Tout is a must. Use the Tout app to create template emails, track open and click-through rates, and remind you to follow up. You can also schedule emails to go out at a certain time. Tip: Review the Email tab in Tout to find those who have viewed your email but never responded and others who haven’t viewed it at all, which is a sign you might need to find a different email address or call them up. Keep track of what others on the web are saying about you. Since this doesn’t include social, I would encourage you to get Viralheat or even use free tools like Topsy to track your brand on social media. Tip: Topsy is also a great tool to find topics that are trending around a certain subject for content creation ideas. If you are managing a client’s social media, Hootsuite will help you gather everything in one place to post and engage with users. Tip: Auto schedule your posts to go live during the prime times on each social network. Here’s a graphic showing each site’s best times to post. If you have the resources, Vocus is a great software that provides a number of tools such as monitoring social and online visibility. They also help you customize landing pages and create targeted messaging. The program will offer you insights into your customers’ journey and behavior as well. Tip: Organization is key to get the most from Vocus. Use their filters, tags and categories to find everything you’re looking for faster and give you better analytics. Both of these submission services will help you get placements for your news releases. Tip: The headline is one of the most important parts of your news release. Your primary keyword should be included and it should not be longer than 170 characters. This site provides thousands of journalists’ bios and contact info to help you give the perfect pitch. You can search by topic, outlet or look up a particular journalist. Tip: One of the most beneficial aspects of Muck Rack is that you can search through all the journalists’ recent Twitter updates, giving you a quick glance at who might be interested in a certain topic, person or event. These basic tactics and tools will help you get started in putting together your online PR strategy. Remember every client will be different and always remain flexible and attentive for new opportunities to earn media and engage with consumers. What tactics and tips have you found to work in your online PR strategy? I would love to hear from you in the comments below. Great article that reinforces the need to up my learning curve and maybe start a budget for some media resource purchases. Glad you enjoyed it, George! Let me know if you have further questions. Having spent the vast majority of my career in PR, (brag note: I am a Fellow of the Public Relations Society of America) I had to laugh a little because the more things change the more they stay the same. All of these tactics aren’t new. Social media is but one more distribution channel for press releases, pitch letters, product demos, etc. I can tell you this: the CEO of a major company would still rather see his name in the print version of the Wall Street Journal. Hey, I jumped on the social media bandwagon back in 2008 when I joined LinkedIn, so I’m all for online PR. But let’s remember there are other ways to reach your targets. Remember in-person meetings? Hi Jeannette, Thanks for commenting. Nothing is ever new under the sun (as Solomon said) but things are shifting. The reason behind using these tactics have changed (depending on your background, mine was in SEO). Yes, a CEO might want to see his name in print but that might not be the best way to spend his money (don’t get me wrong there is a time and place for traditional public relations). As an ONLINE PR specialist though, I focus on reputation management online and digital communication (not print). I definitely agree that in-person meetings are still important to public relations, but this was an introduction to ONLINE PR. I understand and appreciate that you’re an online PR specialist. I’m just making a point that the skills and tactics we’ve used for years are transferrable to online PR. Of course, no one nowadays would mail out a paper news release. We’ve moved the discussion to email pitches and online communications. I did enjoy reading your Online PR post that was well written and learned about Vocus. Jeannette reply brought a smile to my face and I do agree with her 100%. In short, PR is designed to build and protect one’s reputation and image. The result of what you do, what you say and what others say about you. The principles are the same as offline however it all became digitised using and an additional media and distribution channels. Even though, I’m a bespoke Brand developer and strategist, PR be it online and offline play very important part in developing and managing a Brand. Hi Jeannette, I definitely agree with you that the skills are transferable! Thank you so much for all of these useful tips and advice. I want to own my own business in the near future and I know having these skills are very vital going forward in the future. Your generosity is useful knowledge that reinforces the need for me to be more adventerous in learning new skills and approach in the area of business and entrepeneurship. Hi Heather, Glad to help. If you are serious about your own business this is a MUST READ to understand how to best communicate with your publics. It has very practical tips and is geared towards small business owners. Alicia, I enjoyed your educational post.The case study of the Phonebloks using Youtube video is powerful! Alicia, fantastic post! Isn’t it amazing how it all ties together? Like Jeannette my pitches are done by phone or email today. So glad to get rid of that old fax machine. Don’t miss it at all. Fantastik post with lots of great information that I need and will use to get more traffic and publicity for my site and products. Thanks so much! !